I have come to realize over the last year or so that one of my main jobs in life now is to feed 6 humans (myself included). For most of my life, I have taken the task of preparing meals for granted. It never seemed very difficult to get good, healthy meals together, and I like to cook. But, I have never had to feed so many mouths for this many consecutive days (sure, I’ve cooked for up to 30 people at a time, but that’s only once a year or so). It has started to occasionally feel overwhelming. I get up and make breakfast and pack lunches for William and the girls, then make another breakfast for the rest of us. Then, there are snacks to prepare (make sure they are healthy and won’t rot their delicate teeth), and lunches for the remaining three of us, and finally, supper. All the children have their particular likes and dislikes with regard to food, so it is challenging to get food out that is healthy and will be enjoyed by all. I have refused to be a short order cook, and we require them to eat what is served or nothing (though we do cave and offer (home canned) applesauce to anyone on any given night). However, the resultant grumbling and gags when my meal is not to their liking makes the experience quite a bit less enjoyable. This past month I have also had to make a lot of slow-cooker meals. These are great, if I am prepared, because the meal is ready when we all get home 30 minutes before bedtime after swim lessons and there is no waiting for mom to get the meal out. Whew! But, a couple of times, I am not prepared and the meal for that night is cheese toast and apple slices. One night last week, we came home at 7:00 to find the outlet I had plugged the slow cooker in had been turned off and the soup was cold and raw. Luckily, I had a box of mac and cheese (organic!) in the pantry. The kids had that — I had a glass of wine. I guess all of this is to say I have been in a cooking slump for some time. I feel that my repertoire consists of 3 to 4 meals that the little ones will tolerate (beans and rice, stir fry, quiche, and pasta). Luckily, there are a lot of variations to these meals so I don’t feel too stuck. But, the enjoyment of making and eating new things has been curbed. I even won an on-line cooking class (yes, there is such a thing), and for the 2 weeks that I “took” this class, I was culinarily inspired because I got an email from the teacher every morning at 7 a.m. which reminded me I had to cook for my family that day. Thankfully, there were a few recipes in the class that I knew I wanted to make, and a couple were hits — one or two, failures. So, I am looking forward to some change this summer. Summer vegetables and fruit from the garden will be inspiring for me and our children — we have loads of potatoes coming on, and the kids like most summer vegetables (but not tomatoes or eggplant). I also feel good when they are eating lots of fruit and vegetables (not just pasta). Roasted okra, mashed potatoes, sauteed squash, and watermelon or berries for dessert. Perfect! Also, school is out (June 12!!) and the schedule is more relaxed, which will hopefully mean that the children can help me more in the kitchen and I won’t feel rushed to get meals ready (in order to get to school, bed, lessons, etc. on time). 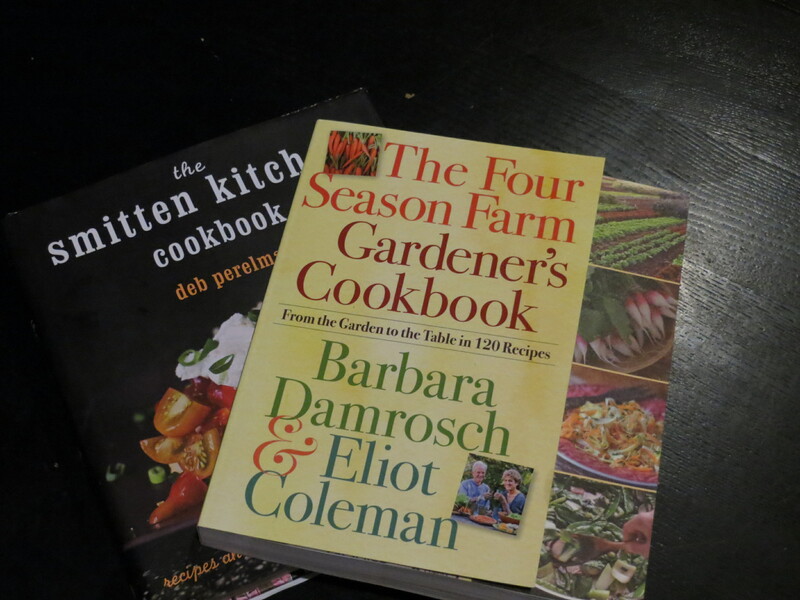 I am also going to use a few new cookbooks I got this year, Smitten Kitchen by Deb Perlman, and The Four Seasons Farm Gardeners Cookbook (I can never remember the name of it, but it is good, and has great garden advice to boot) by Barbara Damrosch and Eliot Coleman. I have made a few things from each of these books and they are great. Even my children have liked most of them! So, this has been a long post, but please share any tips or advice on inspired cooking and cooking for kids. I want to hear about the cooking contest.